I’ve been feeling a bit overwhelmed lately. I have a lot of work to be done between orders from clients, weaving for the galleries and shows, and paperwork. Many things have useful deadlines so that helps structure my days, but that’s not always the case and then a bit of panic sets in. I didn’t think, when I started this blog, that I’d be writing so much about my feelings about owning a business. This morning when things felt really huge and looming I knew that the right next step was to try to write down the plan. Making lists is second nature for me. It helps me alleviate the worry, it helps me sleep at night, and it helps me prioritize. I’ve been struggling for quite a while now with how to best keep track of what needs to be done and how to make time in the schedule for the less tangible output. I’ve played with lists, big calendars with projects blocked out, electronic reminders, daily planners with intents and accomplishments recorded. I’ve got a big shelf unit with pending, in progress, and completed projects. I know I’m a visual planner. If it is out of sight it doesn’t happen. Paperwork seems to get slotted in when it becomes critical: adding pieces into inventory so they can be sold at market or sent to galleries, preparing bank deposits, printing sock labels. Making time for the planning is still weak for me. As long as there is work in the queue I can get away (mostly) with doing less planning. And if there’s no work there’s plenty of time for planning! I think part of the overwhelming feeling lately is the desire to do more of the thinking work but not really justifying the time spent when there are products to make. Every year I feel like I’ve gotten better at this and yet I still don’t feel like I’m good at it. Maybe I need to hit on something tangible to represent planning I can put on that project shelf. As I’m writing this on Sunday afternoon after working most of Saturday I decided that I could spend a bit of time wallowing in the overwhelming instead of making this a full working weekend. Writing this blog post is part of the wallow. Kvetch a little as I organize my thoughts and soon I’ll be ready to get those next steps sketched out. I’m working on a knitting project right now for a client. 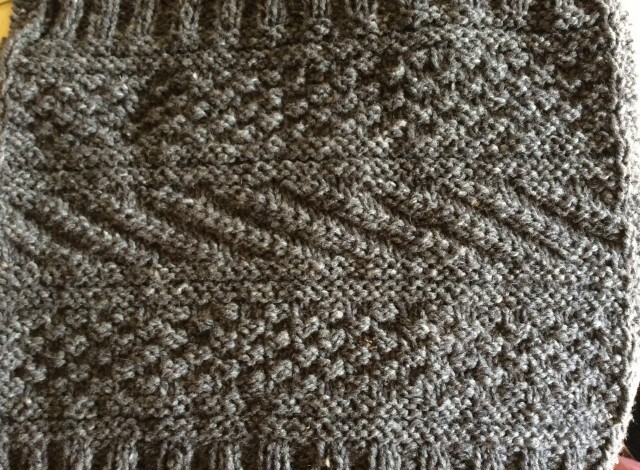 It’s a wrap in gorgeous wool. I know how far along I am, how I’ll know when I’m finished and can probably make a good guess as to how many hours more it will take. Enough wallowing, I’m heading back to the tangible. Meanwhile, I’ve got a pad right here and maybe a list will get made while I’m doing some nice soothing knitting on a nice bounded project. Edited to add: I realized two things right after I scheduled this to post. 1) I maybe need a day off (I should schedule one), and 2) I probably do quite a bit of “planning” and if I stopped to define what some of those tasks are and wrote down every time I did them that I might feel less like it isn’t happening. Today I’m thinking a bit about what it means to be in business. I started out, as many do, by turning a hobby (knitting) into something to do in exchange for money. All of my early work came by word of mouth. I knit shop samples for my friend Ellen who owns Ellen’s 1/2 Pint Farm. I printed up some business cards at home and left them at the local yarn shops who in turn referred me to their customers who knit sweater pieces and needed someone to assemble them. Assembly and repair turned into knitting complete sweaters. Before too long I had a website and a bigger audience than my hometown. I got commissions from people far away who I’ve never met. I kept on knitting samples for Ellen and that work plus a knack for finding errors in knitting patterns turned into an opportunity to do some tech editing and test knitting for a knitwear designer. When I added handwoven goods and knit socks to my inventory I had to shift my mode of operation. Word of mouth was not going to get scarves and socks out of my studio and into the hands of buyers. I started small, approaching a local gallery to see if they’d carry my work. When they said yes it was time to develop more marketing materials: hang tags and sock bands to reveal fiber content and washing instructions and woven labels to sew into my scarves. Oh, and I got to learn about commission. The gallery takes a percentage of the selling price of each item. Though I secretly hoped to sell out quickly (and who doesn’t?) the reality was a slow/steady stream of sales. It was manageable. After more than a year I started to think about approaching a second gallery. I’d been doing the local farmers market and a craft fair, but those are a lot of work. Hauling goods, setting up tent, table and displays, and dealing with weather. I enjoyed talking with customers about my work, but I also hoped for more sales if I had a wider audience. I agonized over this decision. I didn’t think I was ready to handle the extra volume. The gallery was over an hour away so I wouldn’t just pop over to replenish stock. I worried about my capacity to keep up with the inventory when my scarves, hopefully, sold. I finally decided to move ahead. Sales started slow, but picked up around the holidays and I’ll soon have been there for a year. If you’re local, I’ll be at the Norwich Farmers Market Saturday Sept 19 and again October 17. 9-1 Route 5 (we’re outside until the end of October). And I’m at the Vermont Sheep & Wool Festival at the Tunbridge Fairgrounds October 3&4. Come find me in the main vendor pavilion. I’ve just started using Instagram, follow me if you’d like to see more pictures.